Mytrix, Cytrix or Cube: can a $390 tablet deliver the goods? From the time I first read about the ultra low cost Cube i7 Stylus, I was sorely tempted to pick one up to test. But I never took the plunge because buying one of the Chinese tablets would require purchasing from an unknown overseas store. Even when Lisa Gade of MobileTechReview.com posted her favorable review of the Cube and recommended GearBest.com as a trustworthy source for the device, I still balked because of the confusing array of bundles offered there. Last week, a TabletPCReview forum member posted an Amazon link to the Mytrix Complex 11t, a Cube i7 Stylus clone being marketed in the US by a New Hampshire-based company. Just as significantly, the device is offered in only one configuration, with Wacom EMR pen and keyboard cover bundled for $390. Comforted by Amazon's return policy, I decided to give it a go and the device arrived in the SurfaceProArtist labs only two days later. I have to admit that alarm bells went off again when the Mytrix box I was expecting was instead labeled Cytrix. Inside, the nice plain packaging revealed a dark blue tablet and keyboard also (too) prominently branded as Cytrix. Both the box and tablet are clearly labeled Cytrix, even though the company name is now Mytrix. Typing in the CytrixTech.com URL found in the manual redirects to the MytrixTech.com website, where absolutely no mention is made of the former name. The About Us section claims that most of Mytrix's customers are in North America and Europe and that Mytrix is a subsidiary of UShopMall (FY International, LLC), which has been in operation since 2007. I can only guess that the software company Citrix, makers of GoToMyPC, challenged the name and the owners hastily rebranded themselves as Mytrix but are still unloading product with the old branding. Although I only heard about it this week, the Complex 11t was first announced in June, 2015 and was slated to sell for $600 at that time. In addition to the pen, the Complex 11t ships with five extra nibs and an extractor ring. At that price, I would never have bothered, especially given some of the bargain priced devices I've reviewed so far in 2016, such as the HP Spectre x2 and Lenovo Ideapad Miix 700. 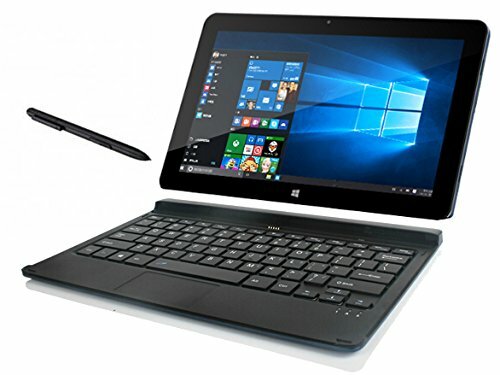 But for just under $400, the Mytrix bundle is almost impossible to ignore: Intel Core M-5Y10c, 4 GB RAM, 64 GB SSD, 10.6-inch FHD display plus the aforementioned keyboard cover and Wacom EMR pen. As tablets with EMR digitizers are becoming increasingly rare, the pen has to be considered the Complex's major selling point. And it's comforting to find the Wacom Feel driver's control panel pre-installed and ready to configure your tip sensitivity and pen buttons. Besides the Feel driver, everything else about the installed Windows 10 Home experience is no-frills, which is actually a relief on low-end devices that are generally stocked full of crapware. Updating the 11t to Windows 10 build 1511 took about an hour thanks to the slow SSD, but once the update was done, the tablet has been running flawlessly. The 10.6-inch 16:9 display is a bit of a throwback to the Surface Pro 1 and 2. After becoming accustomed to 3:2 12-inch displays, the screen size definitely feels cramped, but it's not unusable by any means. By default, the Windows UI is magnified to 150% which is unnecessarily large on the 1920x1080 display. Lowering the magnification to 125% is very readable. The Complex 11t is about half the thickness of the Surface Pro 1 and 2 (above top). Even with keyboard attached, 11t is slightly thinner. The 11t is significantly thinner (.41 inches) than either of the original Microsoft tablets. Sans keyboard, the dense Complex weighs 1.52 lbs. I couldn't find an official weight for the keyboard, but it adds at least another pound. The clamshell design of the keyboard creates a nice, secure cover for transporting the Complex. Unfortunately, the clamshell design has the side effect of creating thin extrusions on the corners of the keyboard right where your palms rest as you type. This is mildly irritating while typing long documents (like this review). The connector at the top of the keyboard is difficult to align with the tablet and usually requires a couple of tries to get right. The keyboard itself lays flat and features miniature keys that are fine except for the tight concentration of the right shift and directional keys. While typing this post, I regularly paged up as I meant to hit the shift key. The small trackpad is also very sensitive. I kept accidentally invoking Cortana, though I have no idea what I was doing to do so. The keyboard includes a function-spacebar command to disable the trackpad, which helps a lot. The clamshell fit requires unfortunate extrusions in the lower corners of the keyboard, right where your palms rest as you type. The right shift and Page Up keys are located too close together. For such a dense device, you might expect the keyboard to work detachably, but that's not the case. The keyboard is powered via a multipin connector to the tablet. Although the keyboard offers only one viewing angle, the connection with the keyboard can be quite fussy, often requiring multiple attempts to seat properly. A welcomed feature is a full size pen silo located at the back of the keyboard. At first I thought the keyboard might included a spare, but pulling out what I thought was a pen turned out only to be a dummy pen cap. Next to the pen silo are two USB 2.0 ports. On the tablet itself, you'll find one USB 3.0 port, a micro HDMI output, an SD slot and headphone jack. An OTG interface cable is included in the package. The 12V power adapter doesn't fit quite snugly enough into its jack, which may be a cause for concern in the future. The tablet ships with a clear screen protector pre-installed that adds quite a bit of tooth. Trying to use the soft grippy nib of the Fujitsu T5000 pen I normally recommend was a non-starter as it grabbed and skipped too frequently on the surface. The Wacom Bamboo Feel pen fared a little better, but it was difficult to get the full range of pressure sensitivity. The ingenious full size pen silo in the keyboard cover is a welcomed addition, although the dummy pen cap in place of a spare is disappointing. To the far right of the image is one of two USB ports. The hard plastic nib of the original Surface Pro pen and the those included with the Complex 11t yielded the broadest pressure curve and most satisfying results. Like that Surface pen, the standard pen includes one barrel button and an eraser tip. I haven't installed a lot of software on the 11t yet. I know most of you want to know whether it will run Photoshop. I expect it will, but if you need to run Adobe software, which can be hit or miss on much higher end devices, I recommend you save your money for a higher end device or prepare to accept less than stellar results. If I get around to it, I'll run some benchmark tests and posts those in an update. This quick sketch done in Sketchable was bit of a chore because of the Fujitsu T5000 pen nib. It was very difficult to make continuous strokes with it against the screen protector surface. This drawing in Clip Studio Paint has much finer line work thanks to the hard plastic nib of the default pen, which had no difficulty registering through the screen protector. I installed much lower cost applications like Clip Studio Paint, Sketchable and Sketchbook Pro and all performed as well as can be expected on a 4GB device. Perhaps it's because I've set a low bar for my expectations, but I struggle to find something negative to say about the Mytrix's performance with these apps. As a bargain basement sketchpad, the Complex 11t works quite well. It's nice playing with an EMR digitizer again, but I'm reminded that the technology is far from perfect. The Complex was reasonably well calibrated out of the box, but Clip Studio Paint was way off in Wintab mode. TabletPC mode didn't yield as satisfying a pressure range as I expected. After running the calibration tool and restarting CSP, I was able to use Wintab mode. However, returning to the desktop, the pen would no longer access the lowest row of the display, making it impossible to unhide the taskbar. I ran the advanced calibration tool, but I couldn't get the pen to hit the target on the lowest left corner of the display. Ultimately, I deleted the calibration information and the pen is working with the default. Clip Studio Paint is working well too. My fix was relatively painless, but if the dead spot on the digitizer is in a more critical area of the screen, you may be out of luck. And as I've reported in the past, manufacturing tolerances on Wacom EMR devices can vary widely, so whether an individual device calibrates well or not is often the luck of the draw. Another cause for concern is that the tablet gets very warm by the power input while connected. Charging is slow, but once disconnected, the fanless tablet cools down. Hopefully this isn't a defect that shortens the tablet's lifespan. The Mytrix website claims a battery life of only 4.5 hours of continuous video playback, but with screen brightness set to 50%, I saw about six hours while writing, drawing and surfing the web. With Surface Books, Surface Pros and VAIO devices regularly listing for multiple thousands of dollars, it's a relief to find OEMs willing to serve the lower end of the market. So whether you call it a Cube i7 Stylus, Cytrix or Mytrix, the Complex 11t is definitely a viable option for those of you on the tightest budgets. I still recommend that you spend a couple hundred dollars more on a device from a better known manufacturer, but that also requires that you go with an active pen which many of you will find an unacceptable option. So long as you've given active pens a fair shot and aren't falling for the EMR vs. ActiveES/N-Trig hype, then the Complex 11t may work for you as well.